Configuring the domain extensions, or TLDs (Top Level Domains), you wish to sell is really easy with WHMCS. The very last row displayed in the TLD list will be the area in which you type the new TLD/extension you would like to add. For this example, we will be adding the domain .co as shown below. In this case we are choosing to use the Enom registrar module to auto setup domains, so we have chosen this from the dropdown. We will now set the pricing for this TLD/extension by choosing the Open Pricing button found immediately to the right of the TLD/extension. On the window that pops up, tick the Enable button for any pricing intervals you wish to set. In our case, we will be specifying pricing for 1, 2, and 3 year terms. 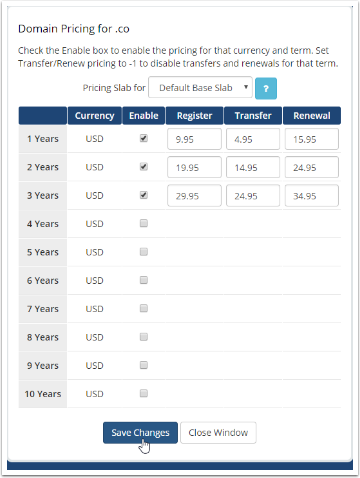 Fill out your desired pricing and choose Save Changes. That's it! 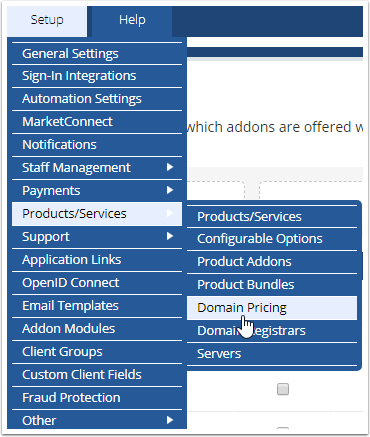 Your WHMCS is now setup to sell the TLD/extension you just setup and provided pricing for!